Gunpla fans are rejoicing over Gundam Build Divers, a new Sunrise anime all about our favorite model kits. But it could be tricky to catch the more obscure Gundam references in the show… until now. Welcome to Deep Dive, a new column from Gundam expert Tom Aznable that points out the more unexpected aspects of the Gundam multiverse that make it into the show. Nothing passes Tom’s eagle eye for spotting this stuff (we suspect Newtype abilities), but this column focuses specifically on rare sightings and deep cuts. Read on to see what you may have missed. The “G5 Attack” scenario features the first 5 generations of main Gundams in alternate color schemes. The first of these is the original Gundam with a color scheme very similar to the GM II. The GM II itself is scarcely different from the original RGM-79 GM apart from this color scheme, with many original GMs actually being upgraded into GM IIs over time. In addition to the color reference, this RX-78 also strikes a classic pose from the original Mobile Suit Gundam opening. This Gundam Mk. II color scheme comes from a version of the Delta Gundam that appeared in a Dome-G planetarium-style show at Gundam Front Tokyo. 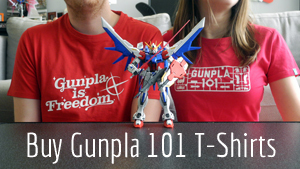 The show takes the form of a presentation put on by Anaheim Electronics of a simulated fight between Amuro Ray’s Zeta Gundam unit 3 and a (likely Char-inspired) red-colored Delta Gundam. Practically the entirety of the battle between the 00 Sky and this Mk. II are visual references as well. The Mk. II firing offscreen and defending against projectiles is a direct reference to the opening cut of the second Zeta Gundam opening. Immediately after, the 00 Sky delivers a kick that’s very similar to one that the Gundam Mk. II does in new animation created for the Zeta Gundam: A New Translation compilation movies. The third Gundam that Riku faces is a ZZ Gundam with the same color scheme as the Dryon III (pronounced as the German Drei), a dark version of the super robot-inspired custom ZZ Gundam gunpla Tryon 3. Attacking alongside the Black ZZ Gundam is what appears to be Amuro Ray’s personal version of the Zeta Gundam. Originally appearing in the multi-screen theatrical short Green Divers, it’s since become a fan favorite. Subsequent appearances include a more stylized looking variation in Gundam Evolve episode 9 and yet another version showing up in the Dome-G show Competition of New Gundam -Red or White-. The unit that appears here in Build Divers looks the most like the original Green Divers version, but lacking the pink graphical flourishes that typically appear in this color scheme. The last of the G5 is a v Gundam in the colors of its novel-only counterpart: the Hi-v Gundam. Funnily enough, this is also a reversal of custom gunpla that appeared in the first gunpla anime, Gunpla Builders: Beginning G, in which the protagonist’s initial rival used a Hi-v colored like the original v Gundam. In another possible gunpla connection, once its fin funnels are destroyed this v also bears a close resemblance to the v Gundam Vrabe from the prequel manga Gundam Build Fighters Amazing. The Kowloon Gundam (or Haow Gundam if you prefer the English dub name) was the original Gundam that Master Asia won the 12th Gundam Fight with. During the 13th Gundam fight, however, it concealed the more villainous-looking Master Gundam underneath its skin. This unit seems satisfied with just using its color scheme.